If you're averse to dust, fast cars, barnyard droppings, clowns, bleating kids, baby animals, knowing-eyed weird birds, snakes, beverages, greasy fingers, dancing, smart-dog-and-cowboy-on-cow action, rabbits, chickens, pies, quilts, flowers, art —even fine art! — and carneys, then you'd better make a contingency plan for June 20-23 (Thursday-Sunday). That's when the 2013 Redwood Acres Fair "The Best of Humboldt" ensnares our fair region, and if you're still in the county you will be forced to attend. Kidding. But we bet it'll be hard for you to stay away as sugar-crustted tentacles of air swirl into your home and wrap charmlike around you. So ... a prescription for the fair faint-of-heart: After you pass through the gate to the fairgrounds, walk straight to Annie the Clown and have her paint on your I'm-having-a-blast mask; or, if you get there at 2 p.m. (or later), let the hypnotist fix you up. Next, load up on stuff for your belly. Then just have at it: Take a "Walk on the Wild Side" and sweettalk a baby maneater. Enter to win a free BMX bike and watch bike gymnasts twist through the air. Tell Nature Joe you like his snakes and stuff. Ride the sparkly twirly things. Bid on some 4-H animals. And holler loudest for the cute Exceptional Rodeo kids. There will bands playing your songs. A harpist to calm your quivering unmasked soul. Roller Derby queens to run away from/chase/moon over. A Ferndale Repertory play to critique. Irresistible fuzzwads to win at the booths. Stock car racers to swoon over. A heady seminar by Curt Pate on stockmanship. Before you know it, you'll be so loose you'll be down there in that beloved dust trying to compete with the four-hooved gals at cow bingo (we hope there will be cow bingo!). The fairgrounds open at 8 a.m. daily and close at 11 p.m. every day except Sunday, when the fair ends at 5 p.m. (and you'll be cryin'!). Admission $11, $5 seniors and kids 6-12. Under 6, free. Thursday, admission is free until 3 p.m. Friday is Race Day (gates open at 5:30 p.m., races start at 7 p.m.). Saturday is Cattlemen's Day and Exceptional Rodeo. Sunday is the Livestock Auction. 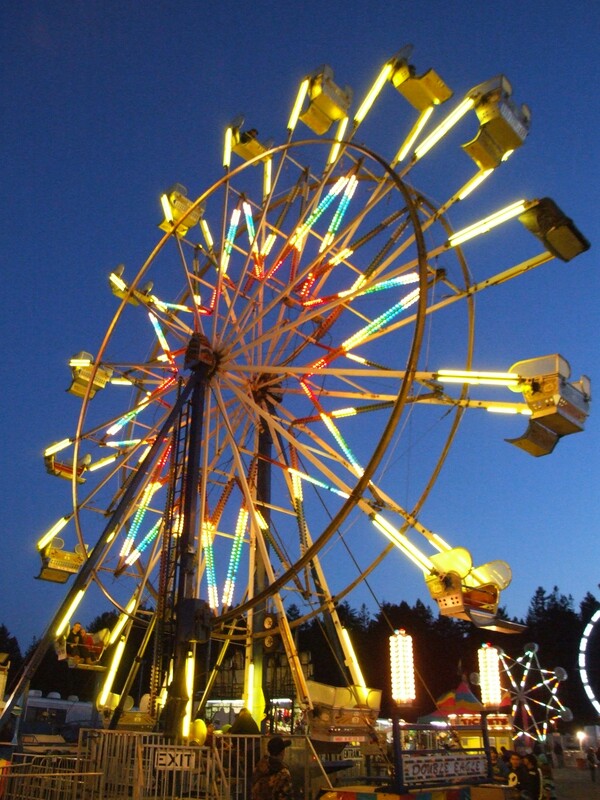 For more info on these and other fair events, check out the schedule on these pages, or go to www.redwoodacres.com.